Sidney Prescott (Neve Campbell) has returned to the town of Woodsborough, where she is promoting her new book. And where Sidney goes, you can bet trouble won’t be far behind. For it doesn’t take long before Ghostface, the stalker who fifteen years earlier changed Sidney’s life for the worse, and literally left the town’s population in pieces, slashes his way onto the scene again. Investigating the new mayhem is Dewey (David Arquette), who despite having been promoted to Sheriff, seems no less dippy. He is now married to Gale (Courteney Cox), the reporter who was previously the bane of his life, and who has now taken time out from her journalistic career to write her first book. But once a reporter always a reporter, and when the murders start again she sees Dewey as her fast track to the scoop of the century. So with the scene set let the blood fest begin! Except that it doesn’t. 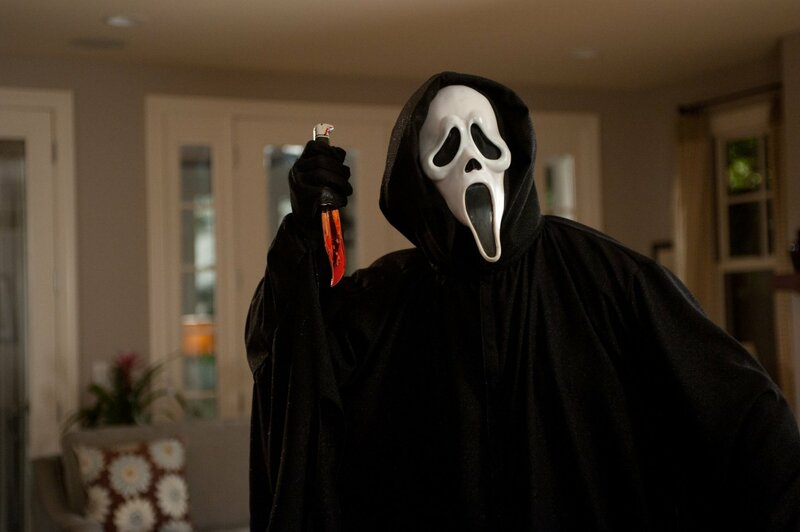 For Scream 4 is really nothing more than a pale imitation of itself. You know you’re in trouble when half way through, a film begins to parody its earlier instalments – which it did much better the first time round. Where the original Scream (1996) shocked you by its sheer originality – who before Craven had had the audacity to kill one of the main billed stars before the opening credits (even Psycho (1960) gave Janet Leigh twenty minutes before Tony Perkins got to work with his knife), this fourth (and hopefully last) instalment leaves you feeling that you have seen it all before. My brief synopsis of the film may appear just that, brief. I’d love to be able to say something sharp and cutting, but there really is nothing to add. The best part was spotting the references to other movies (watch out for Halloween (1978), A Nightmare on Elm Street (1984), The Omen (1976), Suspiria (1977) and the original Scream), and a fleeting reference to the Lord of Horror himself, Christopher Lee. However as so many of these films, and Sir Christopher, are old school horror, I suspect much of the fun derived from this will be lost on the nubile audience to which the Scream franchise is aimed. The kids watching the film may know the ‘star’ names who appear in the now obligatory pre-title slash-a-thon, but they were lost on me (though this is probably saying more about my age, than any weaknesses on the film’s part). As so often happens when you are eagerly looking forward to something, by the time it actually arrives you inevitably feel letdown. The actual result never quite lives up to the anticipation, and you are often disappointed. As a result I suppose I’ve only myself to blame where Scream 4 is concerned – I should have known better. As should have Craven and the residents of Woodsborough. Let’s hope that they now have the sense to pack up and leave this blunt franchise, and never return.